Fort Monroe at Old Point Comfort in southeastern Virginia, today the namesake attraction of Fort Monroe National Monument, has a long and distinguished history. It also hosts an odd little geologic story. If you're familiar with Chesapeake geology, you may guess the punchline, but don't spoil it for everyone else, okay? 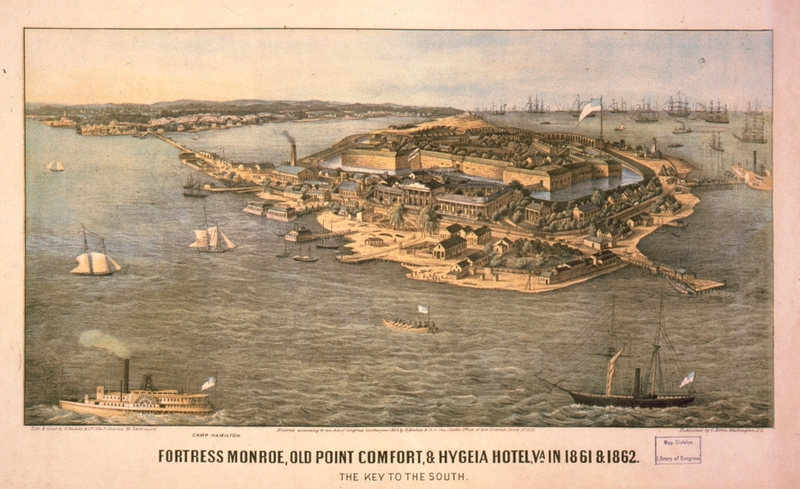 Fort Monroe, during the early stages of the Civil War. Not pictured: somebody contemplating where to sink a well, never dreaming that by the time they stopped in 1869, the war would be long over, the current President would be assassinated, his replacement would be impeached, and the well would only turn up salt water. (image found at NPS monument site). For understandable reasons, it is useful for a fort to have a secure water supply. Logically enough, the staff at Fort Monroe decided to address theirs by drilling an artesian well. Thus it was that in 1845, work began on a well. Drilling continued until July 1846, at which time a pipe broke at 189 ft (58 m). In terms of getting water, this effort was unsuccessful, but for those of us interested in geology and paleontology, the attempt was a rousing success. The pioneering American microscopist Jacob Whitman Bailey identified a number of fossils, particularly from a unit of fine-grained greenish gray sand 48 to 108 ft (15 to 33 m) down). Identifiable material included coal, foraminifera, stratigraphically useful bivalves and scaphopods, and echinoid spines (Fontaine 1882). The mollusks are typical of the Yorktown Formation, now known to be Pliocene. By the time of the Civil War, the fort (which remained in Union hands throughout) was still reliant on a cistern. Another attempt to sink a well was begun in 1864, within the walls of the fort (Woolman 1899). This time they reached 907 ft (276 m) (Rogers 1882) before running out of money in September 1869 (Fontaine 1882). Again, a number of marine fossils were found in the sediments, this time also including abundant diatoms, shark teeth, and whale bones (Rogers 1882). Also, like the first well, there was a distinct lack of potable groundwater. The only significant water was struck at 599 ft (183 m), and it was reportedly very saline (Sanford 1913). There is no sense in doing things halfway, so in 1902 a third attempt was made. This time, they didn't stop until they penetrated crystalline bedrock at 2,254 ft (687 m) (Darton 1902). In eastern Virginia, there aren't a lot of places to view long columns of strata, so this and the 1864 well have attracted a fair amount of interest, popping up from time to time in the literature (e.g. Richards 1945, 1947; Cederstrom 1945, 1957; Powars 2000). Interestingly, Darton (1902) thought there was quite a bit of Cretaceous coastal plain sediments below the fossil-bearing Cenozoic marine sediments, but Cederstrom (1945, 1957) thought it was Cenozoic all the way down. In the end, the well has been quite informative for geologists. In terms of water? The third and final attempt was just as fruitless as the others. When water was tested, it proved to be saline (Sanford 1913). Now for the punchline: they never turned up potable groundwater for the simple reason that they couldn't. What they had no way of knowing at the time was that during the Eocene, approximately 35 million years ago, an object from space blasted into North America about where the tip of the Delmarva Peninsula is today. Fort Monroe happens to be within the area directly affected by the impact. The sediments down to bedrock were rearranged in the blink of an eye and the preexisting aquifers were completely disrupted. In the impact zone, no matter how far down you go, you turn up salty water (Powars and Bruce 1999; Powars 2000). Cederstrom, D. J. 1945. Structural geology of southeastern Virginia. Bulletin of the American Association of Petroleum Geologists 29(1):71–95. Cederstrom, D. J. 1957. Geology and ground-water resources of the York-James Peninsula, Virginia. U.S. Geological Survey, Washington, D.C. Water-Supply Paper 1361. Darton, N. H. 1902. Norfolk folio, Virginia-North Carolina. U.S. Geological Survey, Washington, D.C. Folio of the Geologic Atlas 80. Fontaine, W. M. 1882. The artesian well at Fort Monroe, Va. The Virginias 3(2):18–19. Powars, D. S. 2000. The effects of the Chesapeake Bay impact crater on the geologic framework and the correlation of hydrogeologic units of southeastern Virginia, south of the James River. U.S. Geological Survey, Reston, Virginia. Professional Paper 1622. Powars, D. S., and T. S. Bruce. 1999. The effects of the Chesapeake Bay impact crater on the geological framework and correlation of hydrogeologic units of the lower York-James Peninsula, Virginia. U.S. Geological Survey, Reston, Virginia. Professional Paper 1612. Richards, H. G. 1945. Subsurface stratigraphy of Atlantic Coastal Plain between New Jersey and Georgia. Bulletin of the American Association of Petroleum Geologists 29(7):885–955. Richards, H. G. 1947. 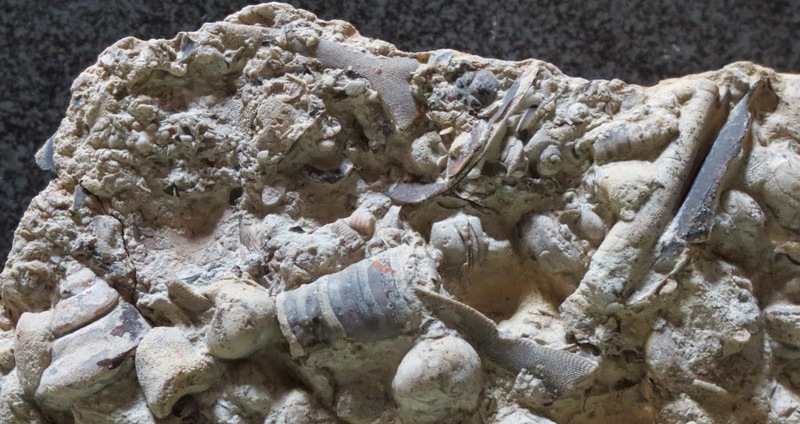 Invertebrate fossils from deep wells along the Atlantic Coastal Plain. Journal of Paleontology 21(1):23–37. Rogers, W. B. 1882. Infusorial deposit of Virginia in the Fort Monroe artesian well. The Virginias 3(10):151–152. Reprinted in Geology of the Virginias, 1884, pp. 733-736. Sanford, S. 1913. The underground water resources of the coastal plain province of Virginia. Virginia Geological Survey, Charlottesville, Virginia. Bulletin 5. Woolman, L. 1899. Artesian wells in New Jersey. Pages 59–144 in Annual report of the State Geologist for the year 1898. Geological Survey of New Jersey, Trenton, New Jersey. Ankylosaurians, be they clubbed or club-less, labor in relative anonymity among dinosaurs, bundles of roughage trundling along, only briefly intersecting the limelight of flashier dinosaurs. A few get a bit more press, enough to put them in a respectable second tier of popularity (Ankylosaurus and Gastonia, particularly). Despite being the traditional namesake for the club-less ankylosaurs*, Nodosaurus is not one of them. Instead, it fills a role not unlike a venerable distant relative who occasionally shows up at family functions to hover on the sidelines. We know he or she is there and we show due deference, but there's no particularly warm connection of familiarity. The closest it's gotten to a star turn since it was named in 1889 was as a John Sibbick illustration in the "Normanpedia", where it is depicted as a sort of vaguely armadillo-like creature suspiciously eyeing the reader and bearing a precise gridwork of button-like armor pieces, without a hint of spikes or plates. Oddly, the skeletal restoration on the next page shows a distinctly different pattern of armor, featuring alternating bands of large scutes between the ribs and smaller pieces over the ribs, which unintentionally give it a sort of corduroy texture. As we shall see, there does indeed appear to a corduroy pattern over part of the animal, but there was also a lot more going on. *This great tradition goes back all the way to the 1970s (Coombs 1978). Prior to this, ankylosaurs were just kind of there as one sort of mash. After this, ankylosaurs were still just kind of there, but now there were two flavors.